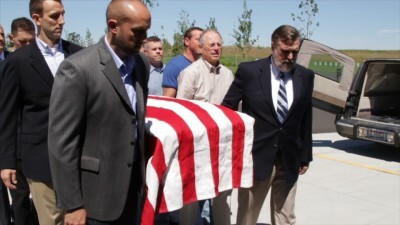 Yesterday my family gathered to bury my dad at the Veterans’ Cemetery in Medical Lake, Washington. It was a beautiful day, the sky was large and blue. Just the kind of day my dad loved. My husband conducted the service and gave the homily, which I invite you to read here. Our son Nate delivered the eulogy, which you can read here. God gave us a sweet time of rejoicing together. So sorry for you loss. Rejoicing for heaven’s gain. I also read Spurgeon’s entry for today, and found ti quite timely for my life as well. I love the image he gives of death as the taking off the clothes of this world in preparation to dress in the wedding garment of incorruption. Although times as these are hard, we who are in Christ have hope and much to rejoice in. Thank you for the reminder. It is refreshing as usual to read your attitude through life’s easy and hard times as equally peerless. God be with you and your family during these fresh moments of your father’s loss. Today at church we sang all 7 verses of “All Creatures of Our God and King” for the processional. At verses 5 and 6 I don’t believe there was a dry eye in the congregation and verse 7 was sung very triumphantly. May you find comfort, peace, and joy in these words as well. We are praying for your continued comfort. Much love in Christ from all the Orrs!